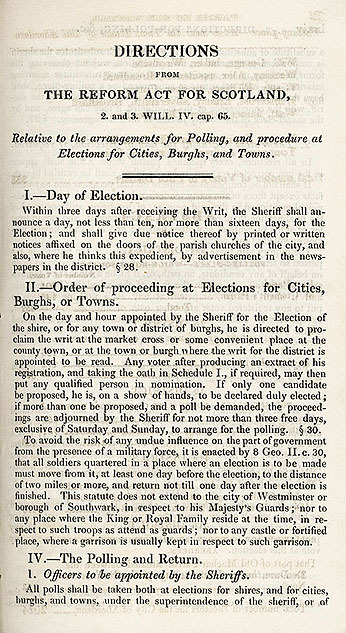 Directions from The Reform Act for Scotland Relative to the arrangements for Polling, and procedure at Elections for Cities, Burghs, and Towns. This pamphlet provides instructions on how to conduct an election under the rules of the 1831 Reform Act for Scotland. On the first page, note how the directions state that the Sheriff should 'proclaim (read aloud) the writ at the market cross'. Today, newspapers, the radio and television let us know of these matters.